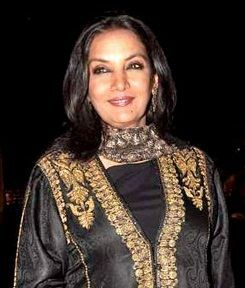 Shabana Azmi (born 18 September 1950) is an Indian actress of film, television and theatre. The daughter of poet Kaifi Azmi and stage actress Shaukat Azmi, she is the alumna of Film and Television Institute of India of Pune. Azmi made her film debut in 1974 and soon became one of the leading actresses of Parallel Cinema, a Bengali new-wave movement known for its serious content and neo-realism and received government patronage during the times. Regarded as one of the finest actresses in India, Azmi's performances in films in a variety of genres have generally earned her praise and awards, which include a record of five wins of the National Film Award for Best Actress and several international honours. She has also received five Filmfare Awards, and was honored among "women in cinema" at the 30th International Film Festival of India. In 1988, the Government of India awarded her with Padma Shri, the fourth highest civilian honour of the country. Read more on Wikipedia.